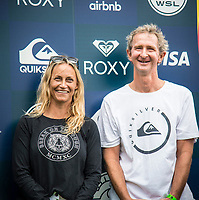 Lisa Andersen (born March 8, 1969 in Ormond Beach, Florida) is a four-time world surfing champion from the United States. She won four titles in a row from 1994 to 1997. 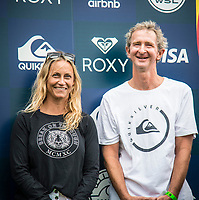 She won the US amateur surfing title in 1985 and turned professional the following year. From 1994 to 1997 she won successive women's world titles before injury forced her to stop competing. She returned to the sport in 2000. She has two children, Erica and Mason. The story of Lisa began on the 8th of March 1969 in Ormond Beach, Florida, USA. She started surfing at the age of 13 and, at this time, she was the only girl surfing in her entire hometown. Indeed, in the early 80's the women surfing was still underground, and surfing in general was the property of men. But she worked hard to settle down and impress her peers with her smooth but aggressive style. 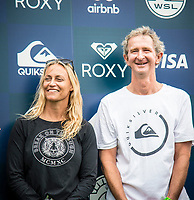 At 16, as her parents were not very enthusiastic with her new passion, she decided to move to Huntington Beach, California to continue on the way she had chosen and to be able to train with the best surfers of America. Then, she entered amateur competitions and won 35 National Scholastic Surfing Association trophies in 8 months and, later, the US Championships at Sebastien Inlet in 1987. After this victory, she turned pro and finished her first year on the tour at the 12th rank and was elected as Rookie of the Year.